Starks Gold: Very late. It’s trees are half-vertical and grows strongly. Easily grown in average, medium moisture, well-drained soils in full sun. Tolerates light shade, but best in full sun. Appreciates consistent moisture. Prefers a sheltered location. 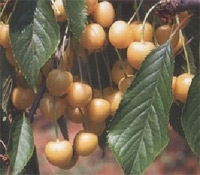 Although not self-fertile, Stark Gold serves as a universal pollinator for other sweet cherry varieties. It’s very fruitful. Fruit is semi-sized, round and gold-colored. It is not suitable for table, it’s more convenient for industry. Also it is utilized for jam production. It is a imporntant variety for Industry. It is pollinated by the varities of Lambert, 0900 Ziraat. Ziraat 0-900 : Very late. It grows fast and vertical and its trees are solid. It’s trees are fruitful and not causing fruit cracking. It also called as “Napolyon”, in Salihli it’s called “Allah diyen”, in Malatya it’s called “Dalbastı”, in Çanakkale it’s called “fıs fıs”, in Akşehir it’s called “Akşehir Napolyonu”, in Uluborlu it’s called “Uluborlu Kirazı”. It is very high quality, firm, with mahogany skin and somewhat lighter flesh. The flavor is excellent and has been readily accepted by consumers. Because of its durability, It is a highly requested cherry for exporting. 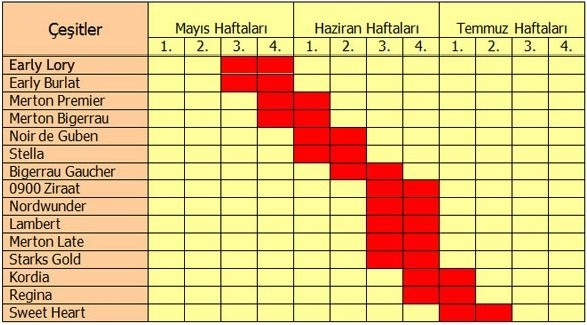 Altough the harvest period is the last week of June, this period could be streched to August depending on the altitute. Adaptable to grow in different altitudes and different climates. It generates a large part of our cherry exporting. It requires pollination. It should be a good pollinator for other late bloomers. Pollinated by Starks Gold, Metron Late, Bigeraau Gaucher, Lambert, and Jubile. Schneiders Nordwunder: Very late. 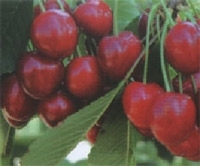 One of the Europe’s leader cherries. It is a mutation of “Schneiders späte Knorpelkirsche” which discovered in Schneider’s land in Guben/Neisse, Germany in 1850. 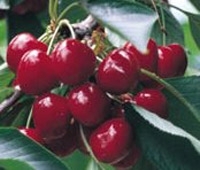 It is a highly preferred sort of cherry in modern cherry plantations in Germany. All round good balance of taste and texture and fills the gap nicely between main season and Lapins. It’s similar to Ziraat 0-900, both the size and the quality. It is highly sensitive to Monilya disease. It is pollinator for Regina and pollinated by Merton Late and Starks Gold. It is the only alternative of Ziraat 0-900. Regina: The form which described here was developed in 1957 at the Jork Fruit Experiment Station, Hanover, Germany. 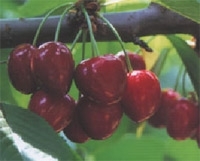 It is a cross between two other German cherry varieties, Schneiders Spate Knorpelkirsche and Rube. It was released in 1981. This delicious cherry produces firm, dark red fruits with excellent flavour.It’s trees are vertical, stong and shaped like a pyramid. It’s a late season cherry, 7-10 days later than 0-900 Ziraat. With Kordia and Sweet Hart it can be used as a high quality variety in late season gardens.Pollinated by Starks Gold, Kordia and Schneiders Nordwunder. Blooming very late, it’s also used as a pollinator for Ziraat 0-900. Kordia: Very late, 4-5 days after than Ziraat 0-900. 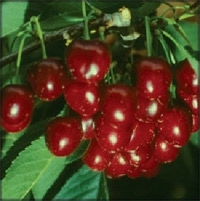 Modern sweet black cherry from the Czech Republic, self-fertile and disease resistant. Outstanding for both flavour and weight of crop. Also known as “Attika” in USA. 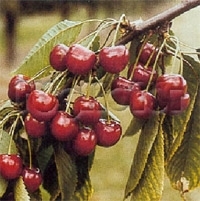 It has become popular with commercial growers and gardeners on account of the good size and excellent flavour of the fruit, and because the cherries are resistant to splitting. Because of its late blooming, it can be used as pollinator for Regina and 0-900 Ziraat. It’s fruits are look like hearts. Pollinated by Bigarreau gaucher, Regina, Metron Late, Stella and Nordwunder.